Arcu arcum, atque ignes igne domans Nemesis. Intrepidus gestans tela, miser lacrymat. Igne ignis, furias odit Amoris amor. Nemesis has fashioned a form with wings, a foe to Love with his wings, subduing bow with bow and flames with flame, so that Love may suffer what he has done to others. But this boy, once so bold when he was carrying his arrows, now weeps in misery and has spat three times low on his breast. A wondrous thing - fire is being burned with fire, Love is loathing the frenzies of Love. Volant, bruslant à son tour. Qu’aux autres a faict souffrir. Le feu brûslé par le feu. 1. This is a translation of Anthologia graeca 16.251. 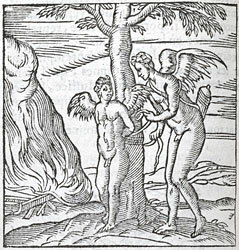 The punishment of Cupid (Amor) for the hurt he inflicts on men is a common theme in Hellenistic Greek poetry and art. This punishment is often carried out by Nemesis, goddess of retribution. Cupid’s arrows and torch are taken from him and destroyed, and he himself is bound, beaten, burned, and pricked with his own arrows. 2. ‘when he was carrying his arrows’. The corresponding line of the Greek text reads γευσάμενος βελέων, ‘getting a taste of the arrows’, and Alciato probably wrote here gustans tela, ‘tasting the arrows’, though this reading is not attested in the editions. Velius’ translation of the same poem in Selecta epigrammata reads expertus spicula, ‘experiencing the darts’. 3. ‘has spat three times low on his breast’. This is a charm to avert the anger of Nemesis for some overbold thought or action. 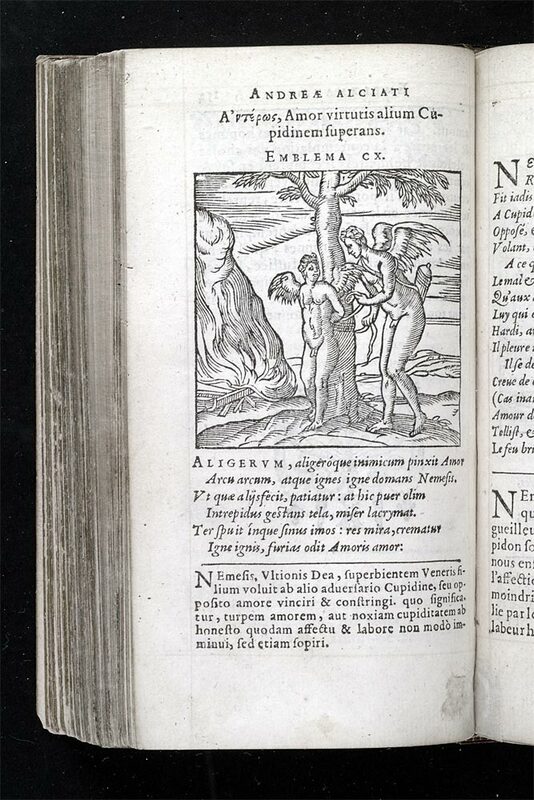 See Erasmus, Adagia 594, In tuum ipsius sinum inspue.